Effectively utilising the shady part of your garden is a distinct challenge that can cause even seasoned gardeners a degree of angst. This week, we look at a few different ways you can turn the shady area of your garden into a unique outdoor space. Grass needs sunlight to thrive, so instead of wasting time, energy and money trying to cultivate a spindly patch of grass in a shaded area, consider reducing the turf in your garden to a small sunny area and then landscape around it with paving, or shade loving plants. 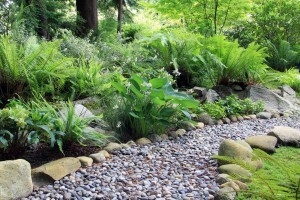 Gardening in the shady area of your yard is challenging but rewarding. If the shade in your garden is caused by the canopy of a tree, it’s likely that the soil is dry and compacted so it will need to be prepared with compost and organic matter before anything can be planted there. There are plenty of groundcovers and flowering plants which like to grow in the shade and even a number of vegetables. If gardening isn’t your thing, consider putting pavers in your shady area surrounded by a hardy, shade loving groundcover like moss. Next, add a bench or hammock and you’ve got yourself a cool, quiet nook to relax in during the warmer months. Sculptures or architectural elements are another simple, plant free way to liven up a shady area. To make the area look it’s best, consider investing in a hardy groundcover like ivy as well as a few lights so that your garden feature isn’t swallowed up by the shadows. Add another layer of sensory experience to your garden with an elegant water feature or pond. Water will introduce sound, light and movement into your shady area and transform it into a key focal point of your garden. What’s more, there are many shade loving aquatic plants that can add colour and texture to your water feature. A Better Driveway specialise in decorative surfacing solutions for Melbourne homes and businesses. Turn hardscaping elements like driveways, paths and patios into stunning design statements with exposed aggregate, coloured or textured concrete. To learn more about our capabilities, please don’t hesitate to get in touch with us by calling 03 5783 4746.